I've been a bit slack on cooking different meals for Bubba recently. I put together a meal plan and as she eats at nursery twice a week she only has a snack on those evenings so for the rest I've been resorting to old favourites. She is still a bit picky in that if it doesn't look right then she doesn't attempt to eat it (I usually end up feeding her by hand). 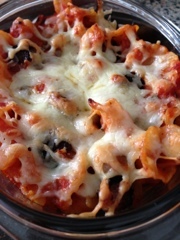 Today I was feeling brave and decided to try her on something different (the same meal as us) sausage meatball bake. 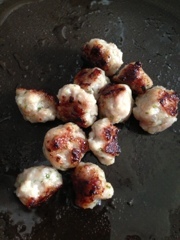 Remove skin on sausage and make it into tiny balls and shallow fry then put to one side. In another pan cook the pasta of choice until its still got some bite to it and then set this aside. Fry the onion, courgette and mushroom until soft (you can add garlic but I didn't). 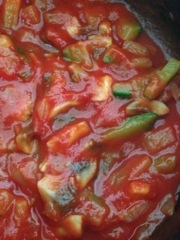 Add enough passata to cover the vegetables and gently simmer. On this occasion I whizzed the sauce so Bubba didn't have issues with the lumps. 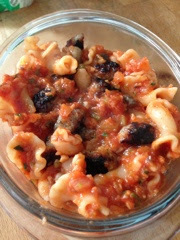 I then added the pasta and sauce together, mixed in the meatballs and put into a dish. Sprinkled with cheese and bake in oven until the cheese is all melty. Then sit back and let your toddler enjoy (or in my case play with the pasta).